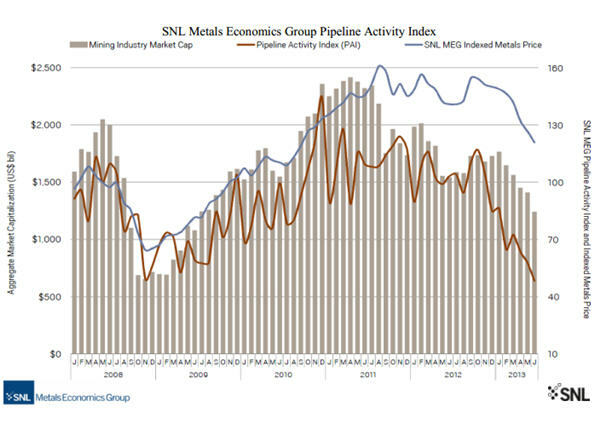 The closely watched SNL Metals Economics Group's Pipeline Activity Index (PAI) – the best indicator of the overall health of the global exploration sector – has fallen to a record low. The Halifax Nova Scotia-based researcher said the industry monitor has now dropped to its lowest level since it started compiling the data in 2008. 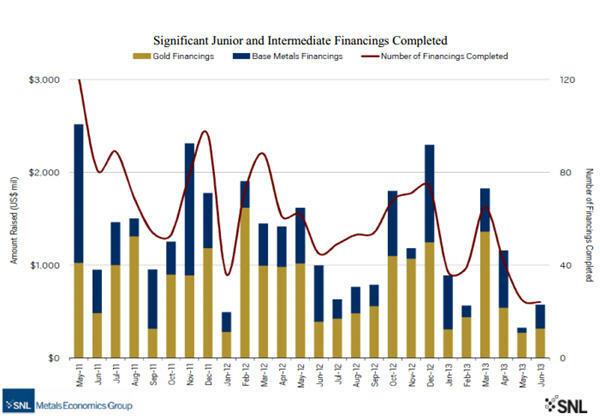 The $585 million raised in May and June by junior and intermediate companies is down two-thirds from 2012 and a staggering 70% since May-June leaving many junior explorers fighting for survival. At the same time the combined market value of the sector has dropped 30% to the end of June and now stands at $1.24 trillion — the lowest level since June 2009, the height of the global financial crisis. Reductions in grassroots spending have resulted in lower numbers of drill results and initial resource estimates, while slashing of budgets and weak metals prices are leading to cuts and delays in capital improvement plans at mines and more shelved development projects. M&A activity is one area we expect to eventually improve; however, many potential buyers remain on the sidelines as shareholders are not in the mood to tolerate unnecessary spending. One bright spot in the latest report was a slight improvement in the number of significant drill results announced in May-June, but as SNL points out it remains 30% below the same period last year. The report adds that while the September quarter is usually the peak reporting season for drill results, "that looks to be almost impossible for 2013".